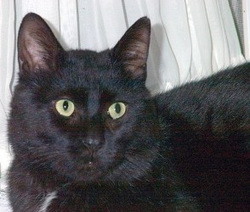 Freddy is a beautiful, friendly black cat, with a large-jowed, round Tom Cat face and gorgeous eyes. He has spent at least two winters outdoors and has seen many battles. A gentle cat, he prefers to run and hide rather than fight, so he was often driven from food and shelter by more aggressive outdoor cats. He is very people-friendly and soon became a favorite in the neighborhood. Freddy now spends most of his time indoors but does like to do a walk-about outside every day. He gets along well with the cats in his foster home, and can be vocal when he wants to be. He runs to greet visitors and rolls on his back to have his tummy scratched. .
Freddy is a very nice cat but needs a home where he can safely get out for a short time every day.